If we’re all still here tomorrow, you should totally check out this new Argrace “Fur Hat” hairstyle. I wanted to wear this in my last post, but it just didn’t go with the outfit. Although I love Argrace hair, it really bugs me that it’s NO MOD/NO COPY. The hair is scripted with a resize script, and a script to change hat texture, but still… no copy is horrible. I also noticed that Argrace sold this hair for $250L, and also the hat by itself, for $250L. If it was mod/copy, I could just remove the hair prims and wear the hat by itself. It comes off as little stingy to not include the hat with the hair purchase, and also, charge the same amount for it :X I would even pay $100L for this hat if it was sold separately, but I won’t pay another $250L for something that should be included with the purchase of a hat hairstyle. I’m pairing this hairstyle with an outfit consisting of pieces from Fishy Strawberry‘s newest items released at Culture Shock (ending soon! on May 22nd). This gorgeous sculpted Wild Nature Skirt comes with an alpha layer to remove some of the legs/waist, and also a skirt (with pose) or a regular without pose version. I am wearing the without pose version, and I think it looks fantastic in photos but is a lil’ stiff for moving/sitting around in-world. This is one of those outfits that’s amazing when you’re standing still. I’ve already worn the Country Life Shirt from Fishy Strawberry several times already, but I just love the sheerness of it, and it pairs beautifully with the skirt. Check out these new Lassitude & Ennui Doll Ankle Boots in Cream! I love it so much, and I also LOVE THE HUD. It’s so easy to use! 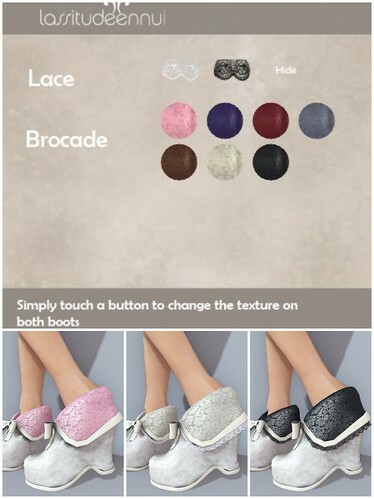 You just click around the HUD to change lace color or hide it, and also select between 7 different brocade colors. You don’t know the the script memory usage of both hair and hat? Since both are no copy, I doubt that the scripts come with a delete option… extra lag, yay!